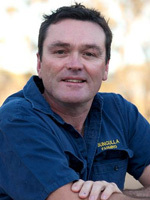 Brad Jones is the Director at Bungulla Farming Pty Ltd, a successful farming enterprise in Western Australia. Brad is a highly motivated and lateral thinker. With a Masters of Business Administration and experience as a service provider to farmers, Brad brings a wealth of knowledge to Bungulla Farming and provides a unique overview of the many links in the agricultural value chain. Bungulla Farming is an early adopter of technology and uses a wide range of data sources from EM and Radiometric soil surveys to variable rate technology. The farm's points of departure from common agronomic practice is in its scope of soil amelioration practices, its use of liquid fertilisers and its low rates of fertiliser inputs. The purpose of these is to minimise the risk to input expenditure from the advent of a poor season and to increase the uptake of soil moisture and mineralised nutrients. Soil moisture, not fertiliser application, is seen as the limiting factor to production. Brad business philosophy is concentrated on sustainable margin expansion through efficiency of inputs and a focus on profits relative to risk. The business employs the well-understood strategies of scale economies and the adoption of new technology to lower average unit costs and increase profit margins. It has augmented its harvest risk strategies by installing considerable on farm storage; in turn, this has created additional margins from blending widely variable protein levels across the farm, opportunities to capture supply chain efficiencies and self-finance working capital requirements.